The HEPA-AIRE H2500IV IntelliVac is the ultimate portable vacuum for residential and commercial air duct cleaning. This full-featured, four-module model has all of the “bells and whistles,” including a performance enhancing "smart" electronics package with Variable Frequency Drive. 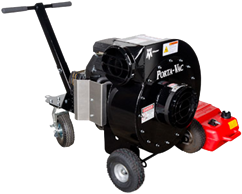 Professional Air Duct Cleaning comes in a powerful and portable package with our 23 HP gasoline engine driven Porta-Vac. More power than an electric motor powered unit with more mobility than traditional truck and trailer-mounted units.